The project involved the complete refurbishment of a four storey terraced townhouse within a Chelsea conservation area including a new two storey glazed rear extension creating a light and bright contemporary home. 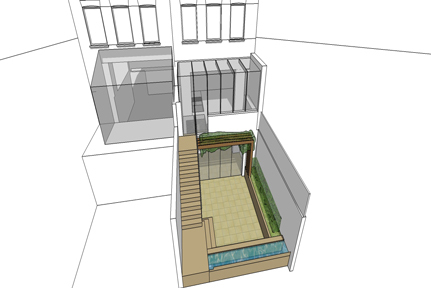 A new direct route via a new stone external staircase has been incorporated to enhance the relationship between the main living areas and the small, newly landscaped patio garden which incorporates a ?vertical planted wall?. The works to the lower ground floor primarily seek to enlarge the open plan kitchen and dining areas by extending and altering the rear façade that includes new fully glazed folding/ sliding screens to increase the levels of natural light entering deep into the accommodation. The proposals incorporated a number of unobtrusive environmentally sustainable installations including a rainwater harvesting system, high efficiency flat panel electric radiators, passive photovoltaic solar panels and increased levels of thermal insulation, to minimise energy use. With the exception of the green slate and waxed oak flooring all materials employed are in neutral hues to provide a suitable space for displaying the client?s extensive collection of art.